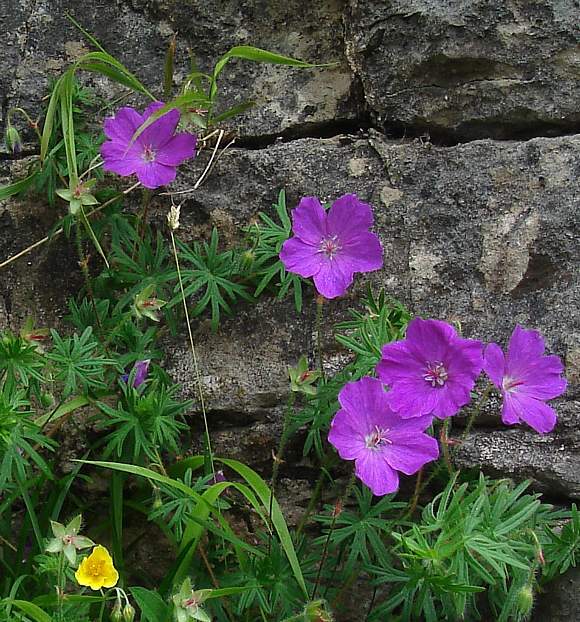 A perennial with short rhizomes which is either erect to procumbent, growing to 40cm. Petals usually a bright purplish-red with just a slight dip (not a sharp nick) in the centre-end. 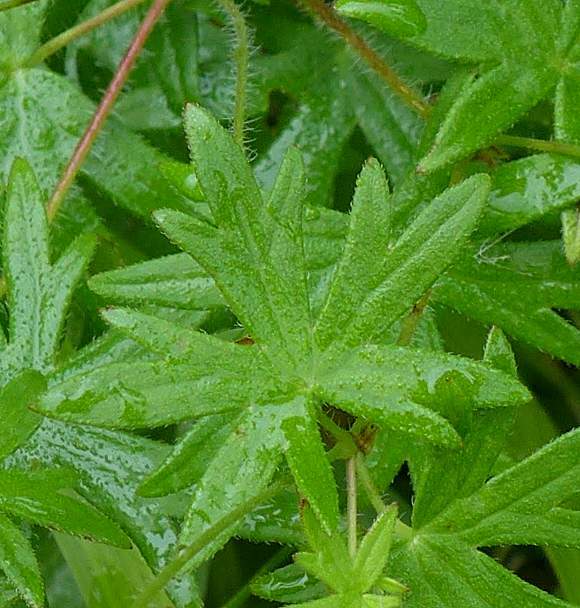 The leaves have between 5 and 7 deeply cut lobes; the lobes themselves also being lobed although not as deeply. The flowers a deep bloody purple. 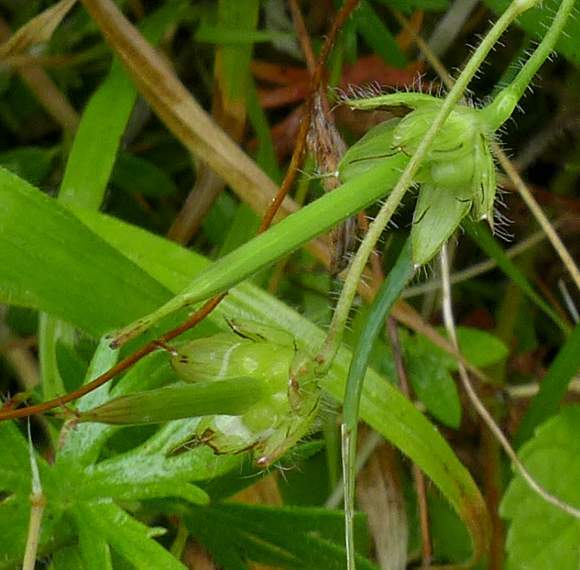 The flower stalks are in two parts, and upper attached to the flower (the pedicel) and the lower (peduncle). The pedicel is ≤2.5cm long. Despite being on Walney Island this specimen is not the 'Walney Pink' variety speciality of Walney Island. 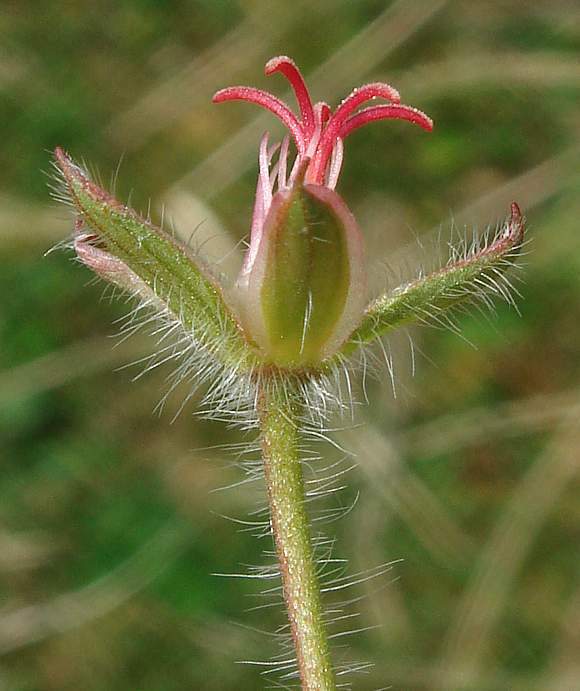 The leaves and un-opened buds are hairy, but never glandular hairy. 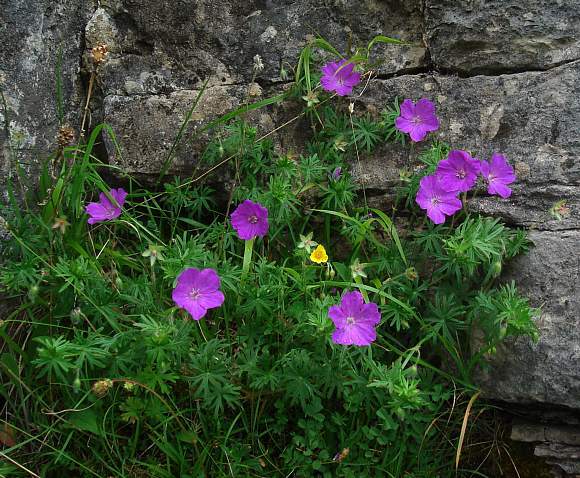 The flowers have 5 petals overlapping on one edge only, some flowers being clockwise. Whilst others are anti-clockwise. Your Author doesn't know if this is significant, or not. 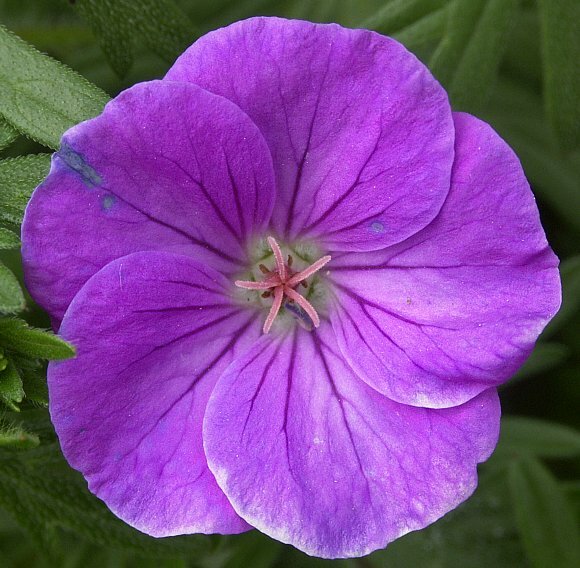 The petals have darker purple prominent veins. 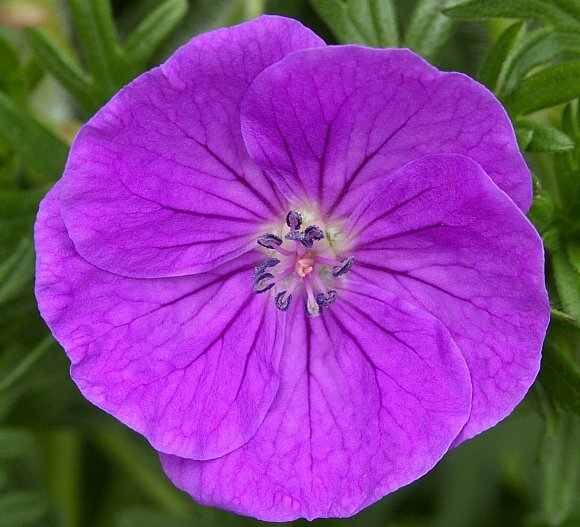 Whilst some specimens do not have overlapping petals. Your Author notes that the bloody colouring reverts to blue on damage. 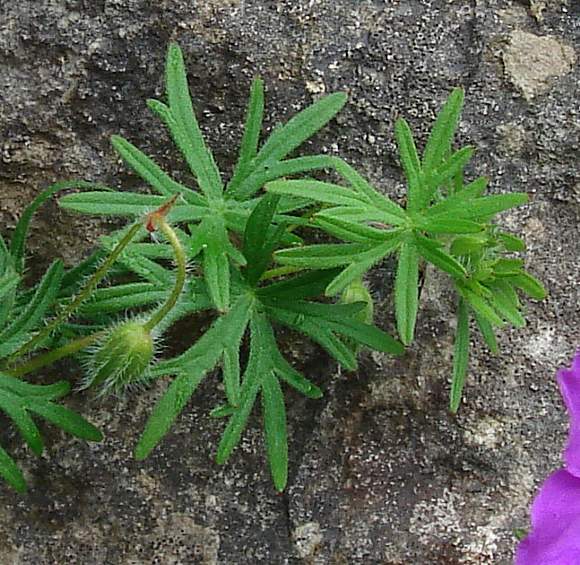 The sepals are lanceolate, not narrow. They are tipped by a short spike. Hairs sparse and not glandular (no bobble at the end). When fruiting a long thing extends from the centre. 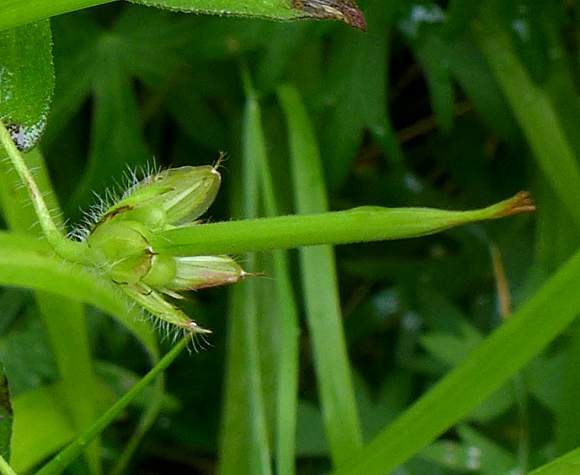 There are 4 seeds, in pairs (bottom fruiting flower). At the end of the extended mericarp are the remains of the 5-pronged style. The 4 seeds are more easily seen here, at the foot of the central column (mericarp). Between 5 and 7 lobes to a leaf, each lobe may itself be less-deeply cut and therefore also lobed (sub-lobes). The drooping flower bud on the left shows where pedicel meets peduncle (at a bract). There are 5 pink styles in the centre; they start off all bunched up like this. 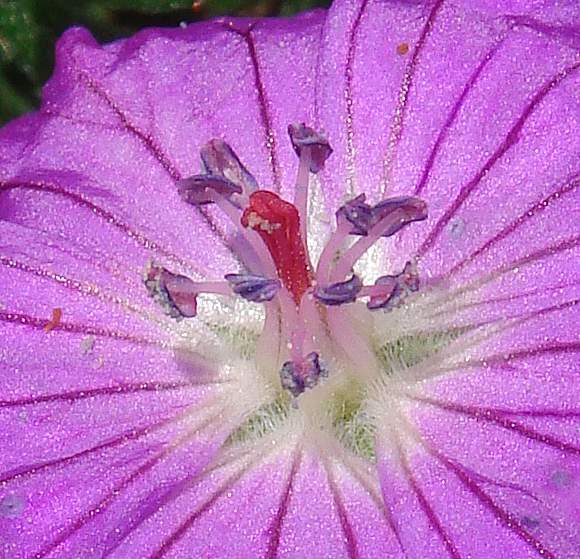 And nominally twice as many stamens with azure anthers. 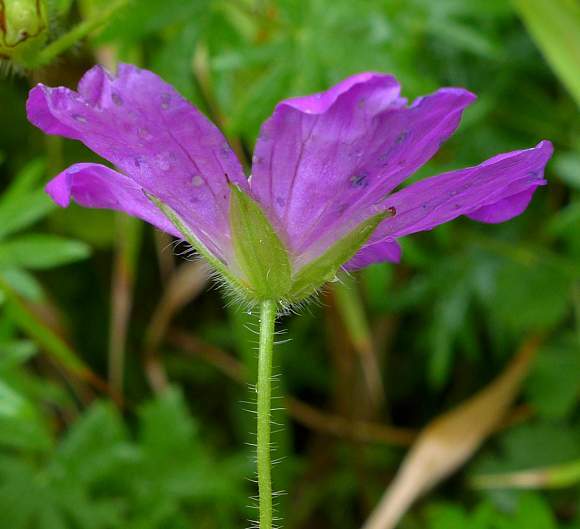 A possible contender for Walney Geranium, a variety of Bloody Crane's-bill which grows wild only on Walney. It is much paler pink with white as well. The veins are much more prominently coloured. The style has splayed out displaying its 5 prongs. The anthers have dropped off the filaments. The petals have also dropped off; this flower is in the process of producing its fruit. 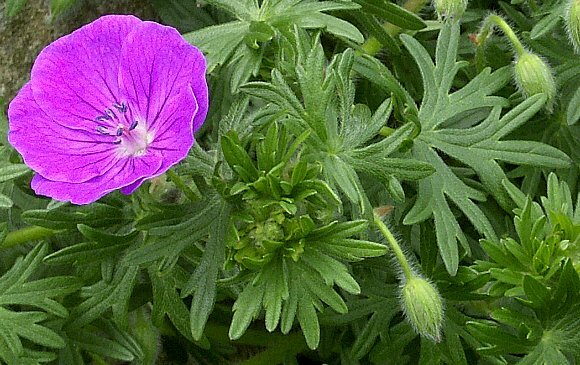 Easily confused with : the sterile hybrid Purple Crane's-bill (Geranium × magnificum) [being a hybrid between two Geraniums which are not found growing wild in the UK - (Geranium ibericum with (Geranium platypetalum)]. 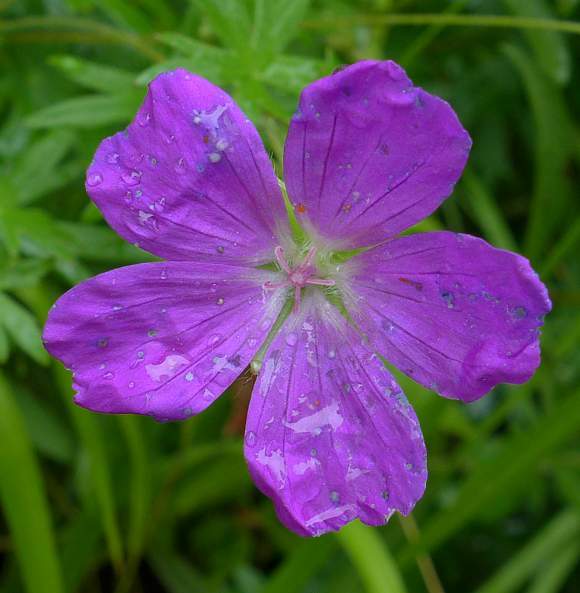 Purple Crane's-bill grows to 75cm, with the leaves rarely lobed to greater than 4/5 of the way to the base, and has both hairs with glands atop and non-glandular hairs which are equally abundant on most parts of the plant and the petals can be marginally larger at up to 24mm, but never less than about 20mm (whereas on Bloody Crane's-bill the range is 14-22mm). 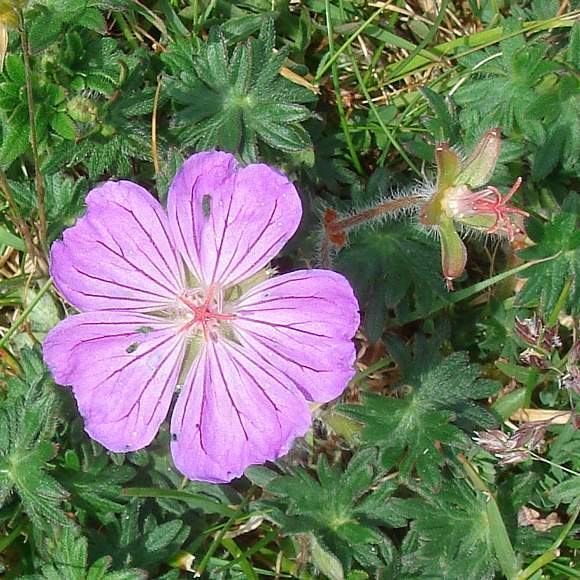 Some similarities to : Cut-Leaved Crane's-bill (Geranium dissectum) but, although also pink, it has much smaller petals only 4.5 - 6mm. 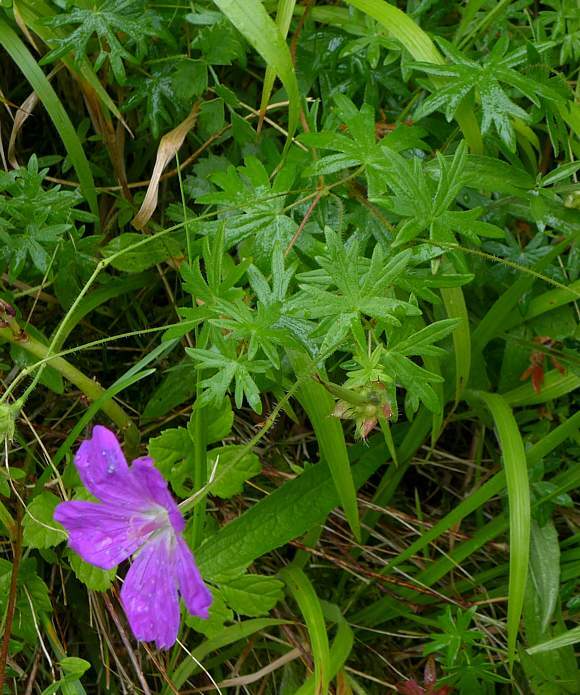 On Walney Island just off Barrow-in-Furness there is a variety of Bloody Crane's-bill which only grows there in the wild, called Walney Geranium aka Walney Pink Geranium (Geranium sanguineum var. 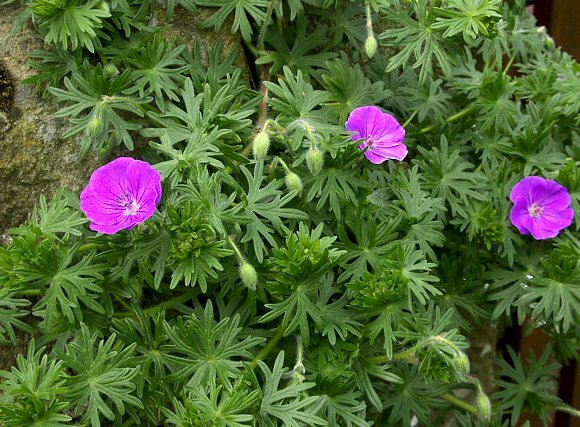 striatum) (formerly called Geranium sanguineum var. lancastriense) which is a either totally white or a much paler pink to white with bright-pink veins on the petals. 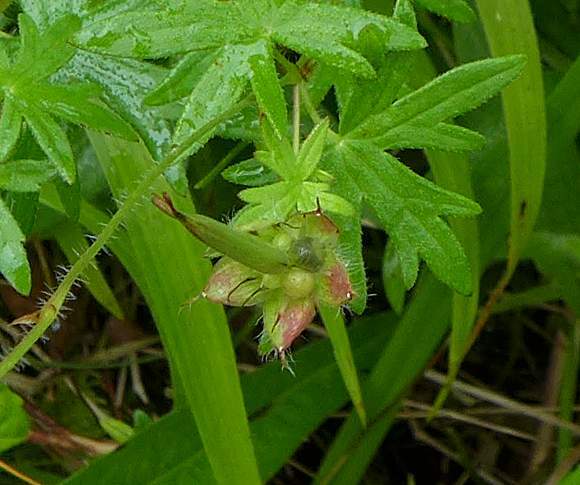 It is a rare dwarf plant, but seemingly can be bought as seed for garden planting. Your Author has looked for this many times, but never knowingly seen one. 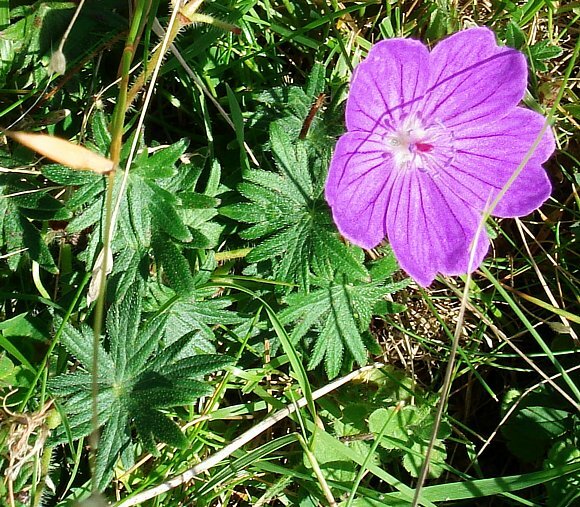 There are other normal geraniums on Walney Island just to confuse.